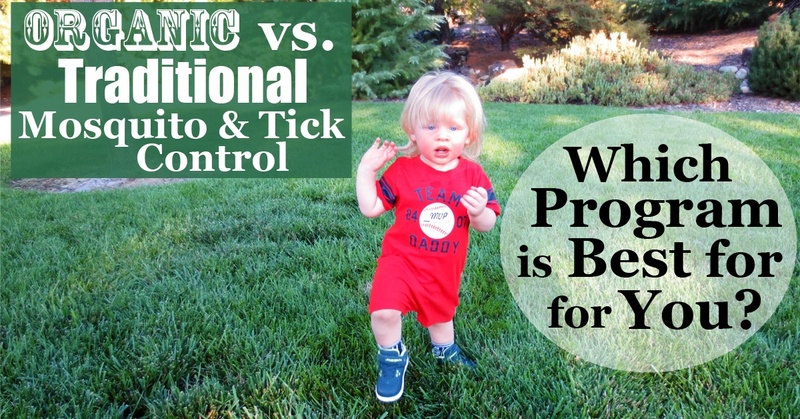 Organic v. Traditional Mosquito & Tick Control: Which is Best for You? Summertime ushers in popsicles by the pool, baseball at the park and warm nights on the patio. Unfortunately, it’s also the season for mosquitoes and ticks! If your yard is a magnet for these bloodsucking pests, you’ll want to consider a mosquito and tick control program. With Traditional and Organic options available, how do you choose the best program? While Traditional Programs give quick results, Giroud’s 100% Organic Mosquito and Tick Program is a completely chemical-free option. Keep reading to see what kind of program is best for yard and also how a Giroud Expert can help you decide! Which Mosquito and Tick Control Program is Best for Your Property? Your Goals: When it comes to your property, we want to know what’s most important to you. Eradicating as many insects as possible in the shortest amount of time? Concerns about children and pets? Chemical free treatments? Targeted treatments for a specific part of the property? Property Evaluation: The current condition of your property must be evaluated. We’ll look at “Hot Spots”, or area where mosquitoes and ticks gather and breed. Does your property have an abundance of shaded areas? Do you have a pool? Is your property located near any natural water sources? Choose the Best Program: Based on your property’s current condition and your goals, your Giroud Representative will explain what you can realistically expect from a Traditional versus Organic program. Then, he will develop a plan custom tailored for your property. Giroud’s Organic Mosquito & Tick Control Program is 100% chemical-free. No pesticides are utilized in this program. Instead, Giroud relies on non-chemical strategies to address problems and uses only 100% Organic treatments. Our treatment is made up of essential oils, such as peppermint and cedar oils, which naturally deter the insects from your property. We’ll treat the perimeter of your property in order to create a bubble of protection. Then, we’ll treat those Hot Spots so you can ensure your yard isn’t a breeding ground for more insects. 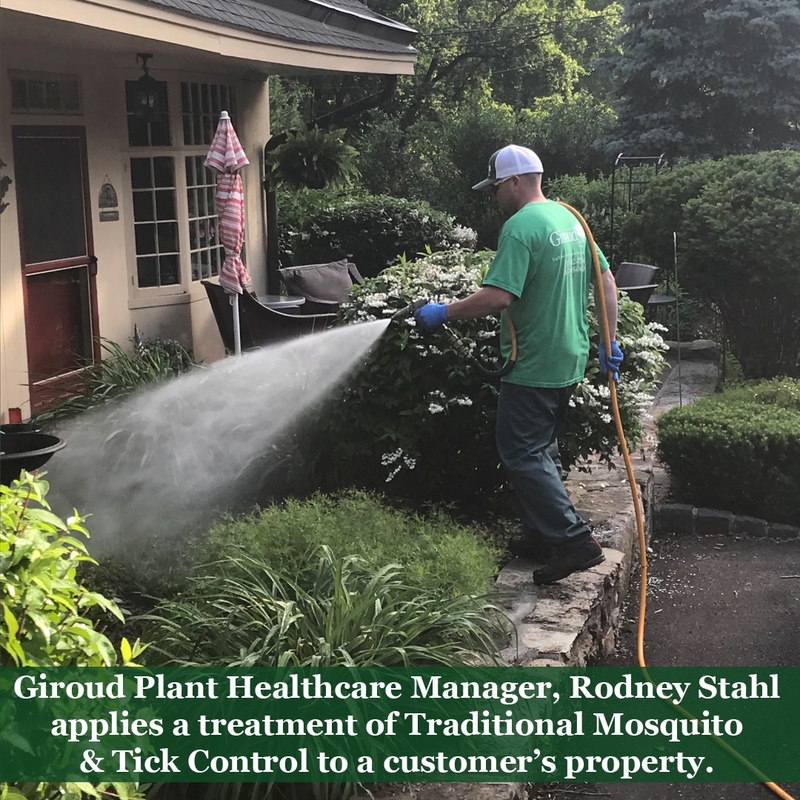 Check out Giroud’s video of Plant Healthcare Manager, Rodney Stahl, demonstrating how we apply our Organic Mosquito & Tick Control Treatments. Once the spray treatment dries (after about 30 minutes), the treated areas are safe for people and pets. To protect pollinators, the treatment is not applied directly to blooms on plants. The Giroud crew is also careful not to get pesticides in vegetable gardens, flower beds or streams, and to protect fish, we do not spray near ponds or creeks.they won’t mate and lay more eggs. Want Organic, But Your Property is Infested with Insects? If you prefer organic but are worried about the number of mosquitoes and ticks on your property, there is flexibility. You can start with the organic program and see how effective it is. If you feel you need more, you can always switch to the traditional program. These bloodsuckers love the shade. Prune your trees and shrubs to get sun on shady spots. Keeping mosquito and tick habitats at a minimum will only make your Organic Mosquito & Tick Control more effective! Every yard is different. Have your Giroud Expert custom tailor a program that works best for your property. Get started today by calling Giroud at 215-682-7704. Inspections are always FREE and are the First Step to enjoying your yard this summer without having to worry about mosquitoes and ticks and the diseases they carry! Organic v. Traditional Mosquito & Tick Control: Which is Best for You? Overall rating:	4.8 out of 5 based on 2621 reviews.